Free CFD Codes: Learn through examples. 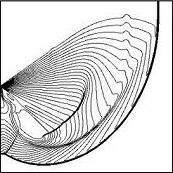 More sample programs are coming up: Delaunay triangulation code, a panel code for an airfoil, 2D unstructured Navier-Stokes code, etc. "I do like CFD, VOL.1, Second Edition" is now available in both printed and PDF versions. Download PDF (FREE) at cfd-boook page. CFD seminar at National Institute of Aerospace is now broadcast online! This code shows two ways to compute flux Jacobians: automatic differentiation and hand-coded subroutines for the Roe flux (inviscid) and the alpha-damping flux (viscous) in three dimensions. This serves also as verification of the hand-coded Jacobians (which are complicated). See how the Roe flux is exactly differentiated. It may be useful also for learning how the viscous flux is computed. What is machine zero? Maybe, it is a non-zero number which cannot be recognized by a machine. So, it depends on machines. Download, compile, and run it to find out the `zero' in your machine. 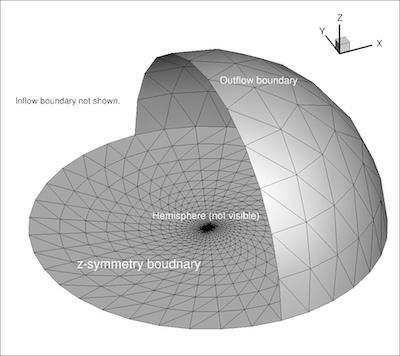 Diffusion equation is solved by 1st/2nd/3rd-order upwind schemes on irregularly-spaced grids. The idea is to integrate an equivalent hyperbolic system toward a steady state. 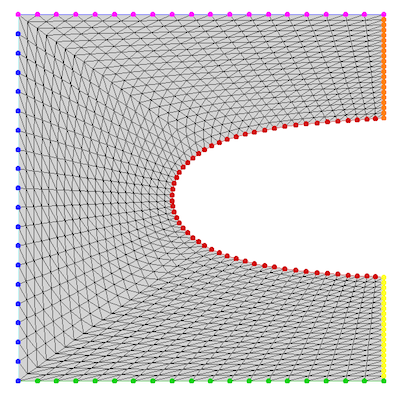 This way, we can advance in pseudo time with a large O(h) time step (not O(h^2)), and compute the solution gradient with the equal order of accuracy on irregular grids. Compare with a conventional diffusion scheme to see how accurate the gradient can be and how fast it converges. Note: This third-order scheme does not require computation/storage of second derivatives. See Ref..
 JCP2017 | Preprint - Third-order accuracy without second derivatives. This module is a GCR (Generalized Conjugate Residual) linear solver, which can be used to construct a Jacobian-Free Newton-Krylov solver (JFNK). The code illustrates how a JFNK solver can be implemented. This is an unstructured advection-diffusion solver. - Designed to solve both steady and unsteady problems. Highly accurate normal gradient prediction on a boundary (steady). This code shows how the round-off error can be minimized in computing a sum of small values, by using Kahan's round-off-corrected summation. MMS has been widely used for verifying the order of accuracy of a CFD code. Grab this code, and learn how it can be implemented. I always use MMS to verify the implementation. It is a very useful tool for debugging. This package contains two f90 codes. 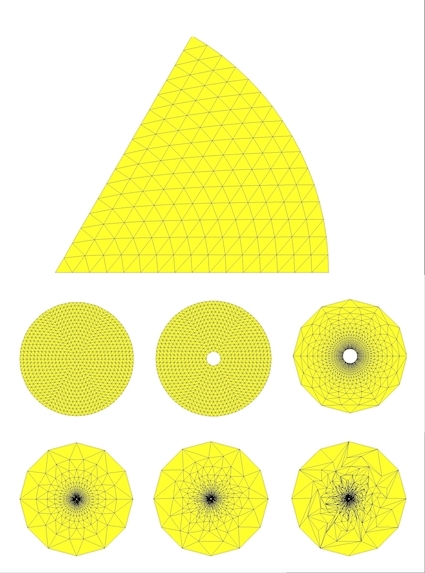 (1)Structured/unstructured grid generation code for a hemisphere-cylinder-hemisphere body. It generates hex-prism structured, prismatic, tetrahedral, mixed prism-tetra, and mixed prism-hex grids. The shape of the body can be defined by a shape function. Four different functions are implemented in the code: a suboff model, a suboff with a hemisphere front, a sine function, and an ellipsoid. (2)A coarsening program. It generates a series of coarse grids from the grid generated in (1). Serious bugs reported. Currently under investigation. Tetrahedral grid in a unit cube is generated and written in the UGRID format. Learn how the hexahedron can be divided into six tetrahedra. Mdify the code to divide the hexahedron into five tetrahedra. 11-24-15: Added an irregular grid version (tetgrid_cube_ptb_v5.f90). 10-06-17: Added a subroutine that computes edge-based data used in the edge-based discretization (tetgrid_cube_ptb_v6p1.f90). This program illustrates the use of a Gaussian quadrature, which integrates a function over a triangle. An example function, x^5 + y^5 -32*x^2*y^3 + x^3*y^2, is integrated over a triangle defined by the vertices: (0.1,0.3), (1.3,-0.2), (-0.9,1.7), and the numerical value obtained by a 7-point quadrature formula is compared with the exact value 0.53726127666666666668, up to 15 significant digits (double precision). The OM6 section data are from [ AIAA J. Vol. 54, No. 9, September 2016 ], and the trailing edge is closed as described in the AIAA jounal paper. This program reads a 2D mixed grid, and generates a 3D grid by extending the 2D grid to the third dimension. A hexahedral grid will be generated for a pure quadrilateral grid, and a prismatic grid will be generated for a pure triangular grid as below. Grids for a Rankine's half body are used as examples. This program reads a Tecplot data file, generates a boundary information, and writes .grid and .bcmap file for edu2d solvers. Tecplot file does not contain boundary information, and so the boundary information is genearted inside the program. Not an elegant code, but it may be useful to learn how to identify boundary nodes for a given grid, which is not really trivial. A grid for a Rankine's half body is used as an example. A 3D grid is generated for a sphere and written in the UGRID format. A tetrahedarl, prismatic, or mixed grid can be generated with a specified y-plus value. 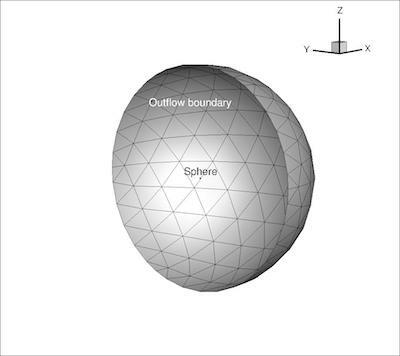 Learn how a 3D unstructured grid is generated over a sphere. A 3D grid is generated for a hemisphere (with two configurations) and written in the UGRID format. A tetrahedarl, prismatic, or mixed grid can be generated with a specified y-plus value. 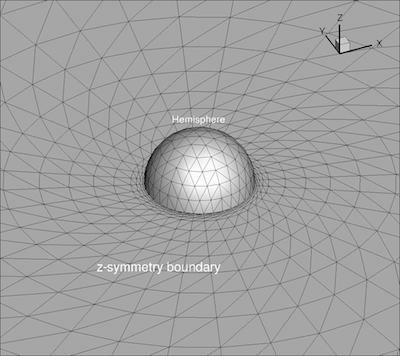 Learn how a 3D unstructured grid is generated over a hemisphere. This program can be useful for generating triangular grids for use in CFD or just learning how to manipulate unstructured-grid (invert, stretch, desired grid-spacing, perturb, diagonal swapping). It generates a simple triangulation of a sector, and then use it to generate 6 different triangular grids in a disk or a 50-yen domain. A tecplot style file is included to generate a picture such as the one below after the code is run. 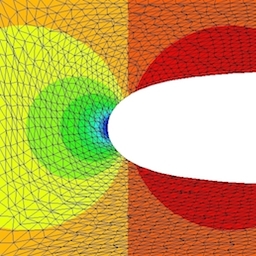 Want to learn how to write an implicit unstructured CFD code? Grab this code, look inside to see how it is written, get good understanding, and then write your own. This code computes a steady flow over a bump with the Roe flux by two solution methods: an explicit 2-stage Runge-Kutta scheme and an implicit (defect correction) method with the exact Jacobian for a 1st-order scheme, on irregular triangular grids. A grid generation code is included for a bump problem. Want to learn how to write an unstructured CFD code? Grab this code, look inside to see how it is written, get good understanding, and then write your own. This code has Roe and Rotated-RHLL fluxes, Van Albada limiter, and a 2-stage Runge-Kutta time-stepping for solving a shock diffraction problem. It works for quadrilateral grids, triangular grids, and mixed grids also. It is set up to solve a shock diffraction problem. You can easily modify it for solving other problems. A grid generation code is included. 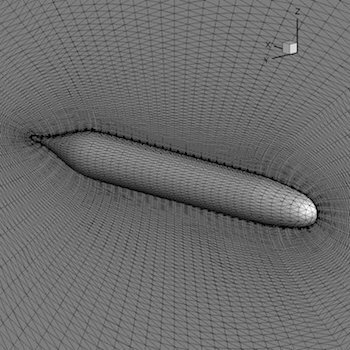 This code reads an unstructured grid file, generate various grid data, go through some dummy CFD solvers, and then writes out Tecplot data files for viewing the solution and the grid. Solvers are dummies and so do not solve anything, but you'll see how a node/cell-centered finite-volume solver can be implemented, e.g., loop over edges, nodes, elements, and computation of least-squares gradients, etc. You can generate your own unstructured CFD code by replacing the dummy solver by your own solver. A grid generation file is included, which can be used to generate grid files you need to run the EDU2D-Template code. A flow over Rankine's half body is an interesting exact solution to the potential flow equations: Cauchy-Riemann systems, Lapace equations, the potential equation, Euler equations. You can download, compile, and run this code to generate a (quadrilateral or triangular) grid, with the exact solution computed at each grid point (stored in Tecplot files). At some point, I'd like to use this solution for verification. 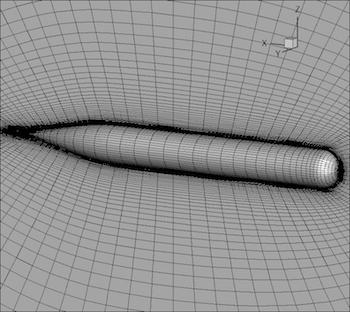 Shown below is the exact x-velocity contours on an irregular triangular grid . This is an MPI program for the Jacobi iteration, solving the finite-difference discretization of the Laplace equation in a square domain. It can be useful for learning how to write an MPI program. Automatic differentiation is nice. It is sometimes used to compute flux Jacobians for implicit formulaitons in CFD. To those who are curious about it, here is a set of files with which you can experience and learn how it works. Simply compile the file "ad_driver.f90" and run it (the other file will be automatically included in the program) to get a feeling of automatic differentiation. 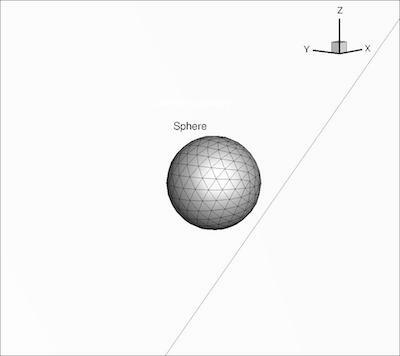 Here are 3D Euler numerical fluxes. Download and take a look. Learn how the standard Roe and a very robust rotated-hybrid fluxes are implemented for the 3D Euler equations, and also how the Roe flux can be implemented without tangent vectors. Included are Roe with/without tangent vectors, and Rotated-RHLL fluxes. I'll be extremely happy if you kindly report bugs. Thank you, arigatou! Bugs fixed for the RHLL flux, more comments added, Roe without tangent vectors added. (04-30-12). The code is available at NASA's Turbulence Modeling Resource (TMR) website. 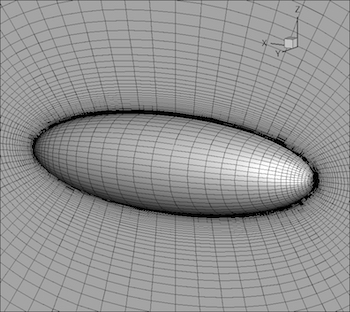 Karman-Trefftz airfoil is an intriguing airfoil for which a complete set of exact solutions can be computed. This solution has been used by many people to verify the accuracy of their inviscid code (incompressible limit). If you have not, use this code now to generate a (quadrilateral or triangular) grid, run your code on it, compute the error, and verify the accuracy of your code. Me? I have used it for my third-order multigrid Cauchy-Riemann solver (IJNMF 2004). Updated (10-13-10). Formula corrected. It works now for cambered airfoils. Believe or not, the diffusion equation is solved by an upwind scheme. The idea is to integrate an equivalent hyperbolic system toward a steady state. This way, we can advance in time with a large O(h) time step (not O(h^2)), and compute the solution gradient with the equal order of accuracy. Compare with a common scheme (Galerkin) for 512 nodes to see how fast the upwind scheme can be. Prismatic grid in a unit cube is generated and written in the UGRID format. It's just a cubic domain, but may be useful in learning unstructured grid data. 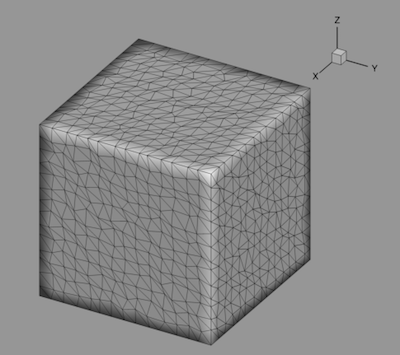 Hexahedral grid in a unit cube is generated and written as unstructured/finite-element data in a UGRID 3D unstructured grid file. It may be useful for those who want to learn a typical data structure of unstructured grids. This is a simple genetic algorithm program for finding minimizers of a function. I wrote this in 1999 when I was interested in aerodynamic optimization problems. I think that genetic algorithm is a very interesting optimization algorithm. Here is a 1D Euler code (1D shock tube code) for solving Sod's shock tube problem, using Roe's Approximate Riemann solver, minmod limiter, and 2-stage Runge-Kutta time-stepping. Learn how a second-order non-oscillatory Euler code is written, or just run it to see how it is capable of computing discontinuous solutions. Incorporate various flux subroutines given below to explore other methods. All numerical fluxes are functions of the left and right states (and possibly dt and dx). Learn how those famous fluxes can be implemented, or just use them to see how they work for various shock-tube problems. Included are Lax-Friedrichs, Richtmyer, MacCormack, Steger-Warming, Van Leer, AUSM, Zha-Bilgen, Godunov, Osher, Roe, Rusanov, HLL, HLLL, AUFS flux functions. Bug fixed for Godunov fluxes. 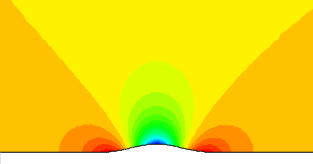 Want 2D fluxes also? Here you are. Download and take a look. Learn how the standard Roe and a very robust rotated-hybrid fluxes are implemented. Included are Roe and Rotated-RHLL fluxes (Riemann Solvers). Bugs fixed for the Rotated-RHLL flux. It works very well now. Ringleb's flow is a famous exact solution of the compressible Euler equations with a smooth transition from subsonic to supersonic without any shock waves. This solution has been used actually by many people to verify the accuracy of their Euler code. If you have not, use this code now to generate a (quadrilateral or triangular) grid, run your Euler code on it, compute the error, and verify the accuracy of your Euler code. Exact solution for a flow over a flat-plate. This solution has been used by many people to verify the accuracy of their Navier-Stokes code. If you have not, use this code now to compute the exact solution at any point on your grid, compute the error, and verify the accuracy of your code. 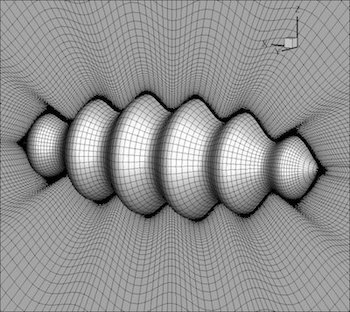 Exact solution for a shock wave internal structure to the 1D Navier-Stokes equations. This solution has been used by some people to verify the accuracy of their 1D Navier-Stokes code. If you have not, use this code now to generate a data file for the exact solution, use it as an initial solution for your code, converge to a steady state, and verify the accuracy of your code.